Family first: Proud dad Matthew Ames outside St Thomas’ Church in Camp Hill during Confirmations with children Luke, 10, Emily, 4, Ben, 9, and Will, 8, and wife Diane Ames. MATTHEW Ames didn’t weep when loving wife Diane explained three times that she had authorised doctors to amputate his arms and legs to save him from death by an infection. But the dedicated father of four couldn’t keep a dry eye when his wife shared that sons Luke, Ben, Will and daughter Emily had to prepare to say goodbye to their beloved dad forever. A week earlier, Matthew developed a sore throat, fever and nausea, and noticed a mysterious rash appearing on his left arm. On the night of Wednesday, June 13, 2012, Matthew was admitted to the emergency department at the Mater Hospital, Brisbane, for what was more than the doctor’s flu diagnosis. “They sedated me the next morning, and the rest of it happened while I was in a coma,” Matthew said. What doctors thought were only flu-like symptoms were actually signs of a severe Group A Streptococcus bacteria infection that had invaded Matthew’s blood stream. The infection led to further complications, and Matthew’s body was soon fighting a severe case of the rare and deadly toxic shock syndrome and necrotising fasciitis, or flesh-eating disease. Diane was by Matthew’s side every second his body deteriorated. “He went in on the Wednesday night, and that night he was given a 50/50 chance of making it through,” Diane said. “I was thinking that he would be the 50 per cent that pulled through. Then he kept on deteriorating. The rash on Matthew’s arm “was just getting worse and worse”, turning “purple and mottled and cold to touch”. “The doctors suggested they amputate his left arm to stop the toxins that were being released from the muscles that were dying affecting his organs, because his organs were shutting down,” Diane said. Diane believed death was the last option for her husband of then 17 years. “Matthew is my everything,” she said. The couple met while both studying Engineering at the University of Queensland in 1990, starting out as friends, then after two weeks of dating, knew they would marry. They married in 1995, one year after graduating from university. 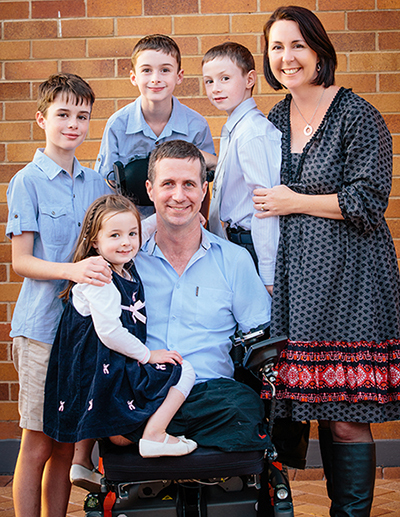 The doctors’ only suggestion was a radical surgery that involved amputating Matthew’s three remaining limbs, but warned there was only a one per cent survival rate. “I was there with Matthew’s family as we talked about it, as the doctors talked to us about it,” Diane said. “We all agreed that Matthew was the person that should be saved and that he would be the person that could handle waking up with no arms and legs. “If there was any chance to save Matthew, I was going to take it. When Matthew survived the surgery, Diane had to make three attempts to explain everything to her husband. “Matthew got woken up and had to be re-sedated because of internal bleeding, so when he was woken up again, he had no memory of what had been told to him the first time, and his reaction was exactly the same, all three times,” Diane said. Matthew said his greatest source of strength in his recovery and acceptance of the situation was his wife Diane. “I think knowing Diane was there, meant that I just kind of knew that everything was going to be okay,” he said. Matthew stayed in hospital nine months, and returned to his Camp Hill home almost 18 months ago. While in hospital, the local Catholic school where the Ames children attend organised a food roster, and 65 families volunteered to deliver morning tea, lunch and dinner for the family. Trusting in God through prayer remained a constant action for Diane and her children. “It’s been a very important thing for us to have faith, and in particular, the children,” she said. “Faith for them is a living thing, and Heaven is touchable, literally. “So as soon as Matthew became unwell, they set up a prayer shrine in our bedroom. “I’ve taken some lovely videos of them praying saying, ‘Daddy, you’re fighting so, so hard to stay with us, and we hope that God lets you stay here.’ It’s just beautiful. Christians from around the globe were praying for Matthew’s life, including connections in South America and the Carmelite nuns in Ormiston. “The kids got a lot of strength from that I think, and also a bit of a kick knowing that someone in South America was praying for their dad,” Diane said. Diane sought strength by her deceased parents to intercede for Matthew. “My parents had passed away two years beforehand, so to me I was talking a lot to my mum and dad, telling them to make sure Matthew’s time isn’t up yet,” she said. Today, Matthew uses a motorised wheelchair, and last month began training with his new prosthetic arm, a 20cm Swedish-designed “stick”. Matthew will have the training arm to prepare for when his new myoelectric prosthetic arm is fitted. He and Diane have also launched their first book “Will to Live”, written with Matthew’s sister Kate Ames. It relives the story of one couple facing a “terrible situation” with courage. Matthew’s will to live life to the full is perhaps the reason he was part of the one per cent who survived. “There’s just so much to live for,” he said. “I’m surrounded by an amazing wife, amazing kids, family, friends, community … The support that I’ve received, we’ve all received, has just been phenomenal. Matthew said he recognised God in the goodness he received from people. “I’ve probably got a pretty living active relationship with God,” he said. Matthew also learned the value of prayer and slowing down while in hospital. “For me, lying on a hospital bed with a tube stuck down your throat with no one to talk to for many hours a day – and if they were there you can’t talk to them, you can only listen – forces you into a state where you kind of have nothing other to do, just to think. “So that time was actually really helpful for me, trying to process what had happened and reflect on what am I here for, who am I.
Matthew said he had also grown in his understanding of “the living God”. “People are just fantastically loving and good. That’s the definition of God for me – not someone who’s kind of removed, but [makes] things happen,” he said. “You can see that good in people who are here and also the legacy that other people have left to make the world a better place. Thankful for all the family and community support over the past two years, Matthew is now looking for ways “to give back as well”. “I’ve been on the receiving end of a huge amount of that humanity. I’d like to see if I can mobilise that for other people,” he said. “To a certain degree I’m fortunate in the fact that you can see pretty clearly what my issues are. “Not everybody’s got that, so how can we actually tell other people’s stories, and get people to understand there are other people who need compassion and support as well? “That’s kind of one of the things I’m hoping to sort of help mobilise – that humanity obviously does exist for helping others. “I’ve really enjoyed going to the local community schools, spoken at a few of the local Catholic schools, and that’s been really rewarding for me. Next: To whom can we pray?